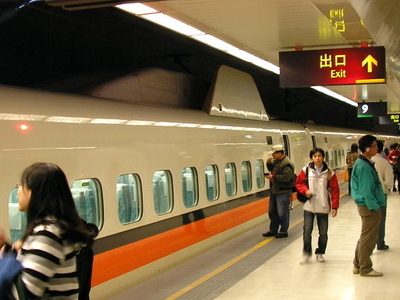 Banqiao Station (Chinese: 板橋車站; pinyin: Bǎnqiáo Chēzhàn) is a railway station located in Banqiao District, New Taipei, Taiwan. The station serves high-speed rail, conventional rail, and metro trains. All tracks and platforms in the station are located underground. The new station building opened on July 19, 1999 for TRA trains, May 31, 2006 for the Taipei Metro, and on January 5, 2007 for Taiwan High Speed Rail. The station currently handles over 106,000 passengers per day.It is due to accommodate trains for the elevated Taipei Metro Circular Line by the end of 2015. 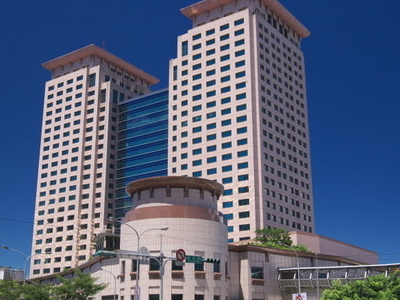 The station consists of a 25-story building above ground and 5 underground stories; it is Taiwan's tallest station building. It includes platforms for the TRA, THSR, and Taipei Metro. The new station building was built as part of the Taipei Railway Underground Project to move railway lines in the city underground. Titled "Evolution Orbit", the Taipei Metro platform has artwork consisting of 12 colorful rings affixed to columns on the platform.These rings complete a cycle every hour and also move whenever a train enters the station. 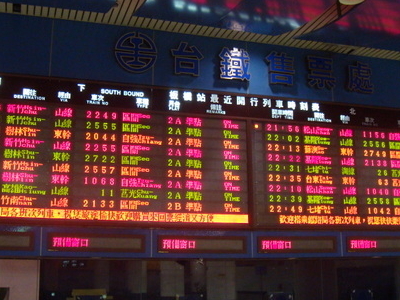 Here's the our members favorite photos of "Railway Stations near Ruifang District". Upload your photo of Banqiao Station!